Wide Open Spaces: How Blockchains Have Moved Beyond Cryptocurrencies — Law Office of Ronald Chichester, P.C. Digital cash is not new. In the past, however, there was always the need to engage a trusted third party that had to maintain a ledger of the transaction. But with bitcoin, each transaction is verified by multiple nodes on a network that records the transaction on a publicly distributed ledger called a blockchain.3 The blockchain technology employed by bitcoin eliminates the need for a third party to be involved in (or record) the transaction. In essence, the third-party verification process has been automated using the blockchain. The remarkable rise in popularity of bitcoin has been described adequately in many papers,4 books,5 and even movies.6 In contrast, this article will identify different uses of the blockchain technology for areas other than currency that have legal ramifications, such as the automated recording of contract compliance7 in business law, real estate, software licensing, family law,8 voting,9 and parole conditions in criminal law. Blockchains require multiple parties and a shared infrastructure. The first requirement is a network. The internet is a suitable network, although depending upon the application, something as small as a local area network is acceptable. Next, three or more computing devices (called nodes) are each equipped with the same blockchain software and are connected to the network in a way such that the nodes can communicate with each other (on, for example, a peer-to-peer network).10 Once the applications are running on the various nodes, and the nodes can communicate over the network, then transactions can take place and be recorded. It is the peer-to-peer character of the blockchain that distinguishes it from centralized ledgers used by financial organizations. The following two diagrams illustrate the distinction. Figure 1 illustrates a traditional arrangement between two parties that, for business purposes, require some type of certification authority. In the scenario of Figure 1, a producer generates a product for a consumer. The consumer will want to verify the authenticity or quality of the product, however, and this is accomplished through the use of a third party, namely the certifying agent. 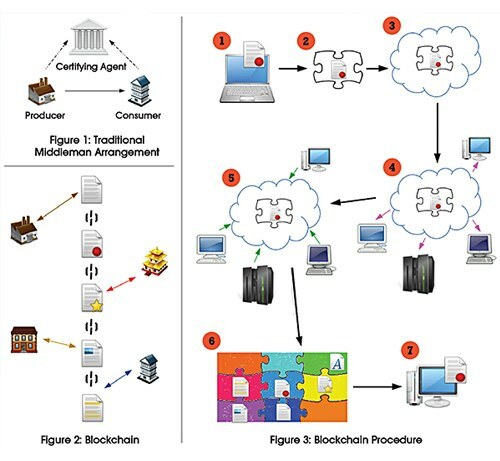 Figure 2 illustrates the centrality of the blockchain between multiple organizations in lieu of a certification authority. In essence, a blockchain can be used to automate or decentralize the certification authority. The process for adding something to a blockchain is illustrated in Figure 3. In simplest terms, blockchains record transactions. To maintain privacy (and reduce transmission costs, storage costs, and simplify the software design), the transactions, once created, and put through a "hash function" to generate a unique transaction "hash value" that has a set length (regardless of the amount of information in the raw transaction data). Some blockchains (such as the one used for Bitcoin) employ a public/private key encryption algorithm to authenticate the transaction request. Use of public/private key encryption is often essential for the "verification" of the transaction (i.e., tying a transaction to a particular sender -- and to no one else; and tying that same transaction to a particular recipient -- and to no other recipient). The process of adding a transaction to the blockchain starts when a person or organization wishes to add, for example, a (signed) contract to a blockchain (step 1). The person puts a copy of the contract into the network blockchain software, which in turn generates a “transaction” (step 2). The transaction is then placed onto the network (step 3), and its presence is broadcast to all of the devices that are connected to that network (step 4). The devices (called nodes) that are connected to the network then “approve” (verify) that the transaction is a valid transaction (step 5). Once validated, the transaction is added to a new block. Once there are enough transactions to fill a block, the new block is then added to the blockchain is then added to the blockchain so that an indelible and transparent record of the block is available on the blockchain (step 6). Interested parties can then retrieve the block and verify its authenticity (step 7), typically by employing a software application called a block explorer. Note, removal of one block, or even one transaction within a block, can be detected cryptographically, which accounts for the indelible nature of the blockchain. As illustrated, the blockchain technology is well suited for digital currency. However, this same technology can be employed wherever two individuals (or organizations) wish to have a verified transaction involving something of value or a service or other action. Blockchains are an obvious choice for organizations that need to record transactions and do so in an automated and inexpensive way. Take the scenario involving a software license when its owner is a developer who is a solo or small operation whose longevity is in question by a much larger customer (who depends upon that software for critical operations). In such a case, the customer often requires that the software developer deposit the current version of the code base to an escrow agent as updates are made available so that the large organization can be assured of continued critical operations if the developer dies or otherwise discontinues development or maintenance of the software. With blockchains, the software developer can avoid the expense and encumbrance of the software escrow agent by providing an encrypted file of the source code of the application to the customer through the blockchain (in exactly the same manner that bitcoins are transferred). Similarly, if an escrow event is triggered, the cryptographic key for the software can be sent to the customer using the same blockchain method. The State of Delaware recently amended Title 8 to its General Corporation Law to allow blockchains to be used for any business practice, including general ledger, business (money) transactions, and even selling shares of company stocks. There is no reason to think that transactions recorded on a blockchain could not be admissible in court. While an expert may be needed to opine on the authenticity of the particular blockchain and the specific transaction, there is nothing inherently different about blockchains than other software programs, or about blockchains use as a ledger of transactions.12 Moreover, the mere presence of the transaction on the blockchain may obviate the need for litigation in the first place, and certainly could automate discovery and thus reduce litigation costs. Finally, there are also techniques (besides encryption) that can be employed to keep the contents of the agreement secret yet still enjoy the benefits of blockchains. The blockchain model provides a public evidentiary mechanism for actions undertaken by parties. In other words, they can be used as a public recording of actions taken (or not taken) by a party in an agreement. Because the blockchain method is implemented with software, the transactions can be embedded into existing software systems, thereby leveraging automation, with the records contained within being admissible in court. Thus, blockchains can potentially reduce costs and risks associated with the monitoring or existence of agreements between individuals and organizations. 1. Software is written in the form of instructions according to the syntax of a programming language. Those instructions are called source code. Source code is then compiled or interpreted into a language usable by a processor to perform the intended instructions (e.g., a software program). Open-source refers to the method of licensing copyrighted source code in a way that ensures its use and accessibility by all. According to the Open Source Initiative, “[t]he ‘open source’ label was created at a strategy session held on February 3, 1998, in Palo Alto, California, shortly after the announcement of the release of the Netscape source code. The strategy session grew from a realization that the attention around the Netscape announcement had created an opportunity to educate and advocate for the superiority of an open development process.” See, e.g., https://opensource.org/history. See also, Josh McHugh, For the love of Hacking, Forbes (Aug. 10, 1998). 2. Satoshi Nakamoto, Bitcoin: A Peer-to-Peer Electronic Cash System, p. 1 (Abstract). 3. Joshua Kopstein, The Mission to Decentralize the Internet, The New Yorker (Dec. 12, 2013). The article states that bitcoin uses the “network’s ‘nodes’—users running the bitcoin software on their computers—collectively check the integrity of other nodes to ensure that no one spends the same coins twice. All transactions are published on a shared public ledger, called the ‘block chain,’ and verified by ‘miners,’ [who are] users whose powerful computers solve difficult math problems in exchange for freshly minted bitcoins.” Id. 4. See, e.g., https://en.wikipedia.org/wiki/Bitcoin, https://bitcoin.org/bitcoin.pdf. 5. See, e.g., Mastering Bitcoin—Unlocking digital currencies. 6. See, e.g., Bitcoin: The End of Money As We Know It (2015). 7. See, e.g., Florian Glatz, Smart Contracts, Platforms and Intermediaries. 8. See, e.g., Belen Marty, Couple Make History with World’s First Bitcoin Wedding (Oct. 7, 2014) (where the wedding was recorded using a blockchain transaction). 9. See, e.g., Alyssa Hertig, The First Bitcoin Voting Machine Is On Its Way. 10. Installation of the software is quite easy. For those running Apple OS X, you simply bring up a Terminal (under the Utilities menu) and type: sudo easy_install pip | sudo pip install blockchain; for Linux users, check your packages manager and see which blockchain client applications (such as Electrum) are available. If all else fails, you can use (on Debian): sudo apt-get install python-pip | sudo pip install blockchain; for Windows machines, the Ethereum blockchain is now provided as a service on Microsoft Azure. You can get Ehtereum Blockchain as a Service (EBaaS) at the enterprise level. See, e.g., Marley Gray, Ethereum Blockchain as a Service now on Azure (Nov. 9, 2015). 12. See, e.g., cases involving Rule 803(6) of the Federal Rules of Evidence and the Texas Rules of Evidence, both of which concern the heresay exception for records of “regularly conducted activity.” Texas Rule of Evidence 803(6), which includes “[a] memorandum, report, record, or data compilation, in any form ...” Importantly, Rule 803(7) allows the absence of an entry kept in accordance with the provisions of 803(6), which can be quite important in the blockchain method because a simple review of the blockchains would easily show entries that are not in the defendant’s blockchain record but are present in both the plaintiff’s and third party blockchain records.